The relaunch is part of a broader digital-first strategy, which has already seen the introduction of a redesigned app and mobile site that have in turn influenced the design of the Guardian newspaper and its supplements. The new site has been tested for a year leading pp to the global launch with the Guardian’s US and Australian audiences being the first to trial the new versions. The first iteration of the new website was unveiled at the start of last year. New ad formats include a responsive full-width banner and an expandable responsive banner in the middle of the homepage and each landing page, as well as parallax MPUs (Mid Page Units). 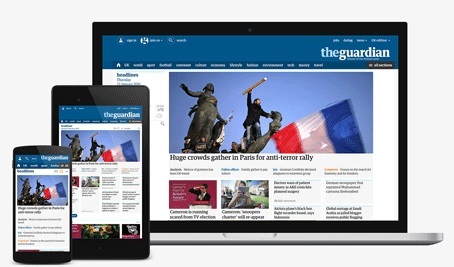 The new formats will help advertisers to reach and engage with the Guardian’s audience on whichever device they are using, whilst retaining the design of the site. The new theguardian.com uses a flexible ‘container’ format, which reflects the way people consume news and features, rather than how they are produced. Containers can be customised in a variety of different ways to highlight stories, allowing editors to think beyond simply building a page, to creating a collection of stories that bring each day’s news to life for readers. It also allows for a clearer emphasis on live and up-to-the-minute news, while bringing audiences closer to the Guardian’s journalism by offering more ways to share stories and participate in the conversation.